As much as I whine and moan about wanting it to be fall, it still is summer and will be for awhile. So, I'll share with you one of my favorite go to summer colors. I think I have a go to color for every season. For me, go to colors are the colors I reach for when I'm at a loss for what to paint my nails. I either don't really feel like going through my stash or I just can't make up my mind at all. In my case, they are usually pretty standard colors they are not overly unique or different, but they're nice colors that do the job. Tropical Fiesta is a bright warm pink creme. It's a bright color, but it's not neon. I really like this shade a lot. It works great as a mani, but I prefer it more so for a pedicure, It's that perfect summer pink creme. I think it's universally flattering. Like I said, this is far from unique, but it works as a great summer color. I've never been unhappy with this on my nails! Do you have any go to colors? What are they? You should have warned me to put my shades on before I came here. LMAO Its awesome and I see why its a 'go to' for you. My easiest "go-to" lacquer is Claire's mood polish in calm/wild. I can always pull it out and it will make me happy. Sometimes tho I do get in a weird mood and put on a sheer - which I never normally do. But I find I wear them when I'm sick and when I can't think of anything else to wear once in a while. OPI Its all greek to me is my go to colour - shimmer and pinky/red. One of the first polishes I got and I still wear it all the time. I'm following you. Maybe you can follow me, too? 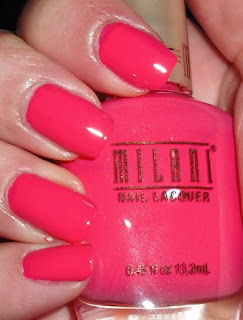 Lacquer- I have wild/calm and havent' worn it yet!I really need too! Aggie-Ruby Pumps is an AMAZING go to color. You can't get any better than that! Lisa- I used to have some polishes from the OPI Greek collection, but the got lost in transit somewhere during one of my moves :(.